Founded in 1987 by J.D. Young, Tulsa Rig Iron was the premier designer and manufacturer of horizontal directional drilling rigs, along with mud pumps and mud recycling systems. In 2004, sons Trevor and Troy took the company helm and made the decision to concentrate the company efforts on building the best mud pumps and recycling systems available. 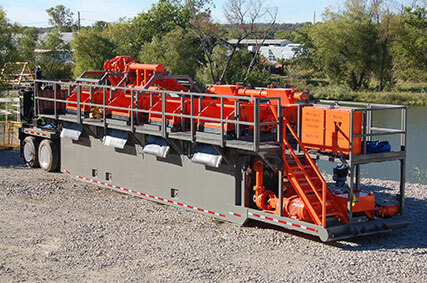 Since that time, Tulsa Rig Iron has continued to set the industry standards for mud pump and recycling systems and is the manufacturer of choice for contractors around the globe. Fourth quarter 2013 marks a significant company milestone, in that we will effectively double our manufacturing capacity with a huge facility expansion. This will allow us to get equipment to our customers in a more timely fashion. Our state of the art manufacturing facility is located on 20 acres in Kiefer Oklahoma, a suburb just outside of Tulsa. Tulsa Rig Iron is dedicated to being the industry leading provider of products and solutions for energy contractors. We will always have the best interest of our customers, our employees, and the environment in mind while designing and delivering our products and services. Quality - Giving our best with unmatched results. Reliability - You can count on our products and our employees. Integrity - Acting with honesty without compromising the truth. Product Excellence: We are committed to engineering and manufacturing superior quality products for our industry. Customer Service Excellence: We are dedicated to satisfying the needs and honoring commitments we have made to our customers. Team Excellence: We promote a unified team, working together to meet our common goals.